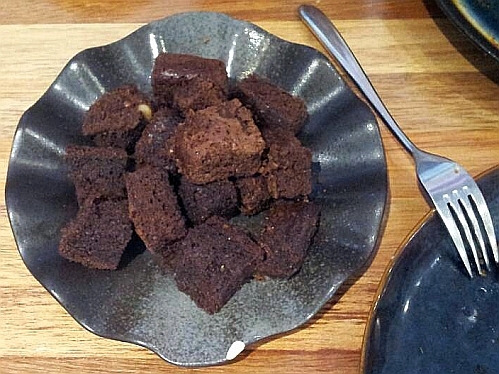 The dessert is 3 small cubes of brownie and since there are 10 of us, they served all our portions in 3 plates instead of 10 plates. My friends did not eat many pieces of this so I helped myself to them in order to clear the plates. Please click on the image for a larger view. Which set would you choose? 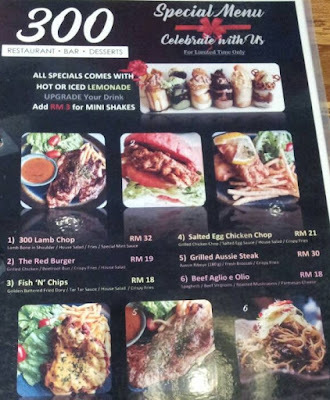 There is another menu - a special menu where you can upgrade the free lemonade drink to a mini shake. I like to eat salted egg dish but I don't quite like chicken chop so I did not try item 4). 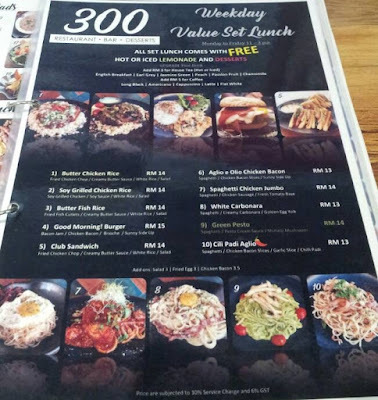 The name of this eatery is 300 and it is located in Damansara Uptown. and you like to eat chicken. I guess that is why they gave the yogurt mint dip. I had spelling errors hence I deleted my first comment. 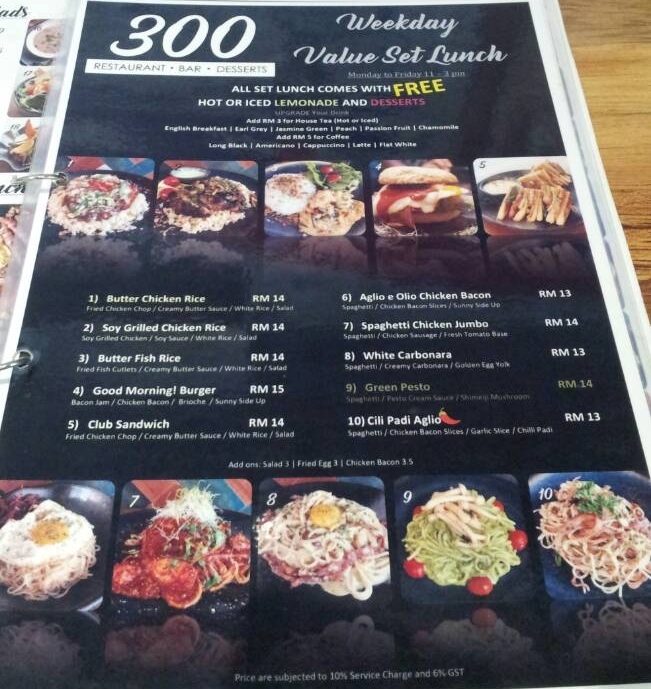 Anyway, I was saying that this 300 used to be Pattisez where I had the Freakshakes. I have not visited since they became 300. 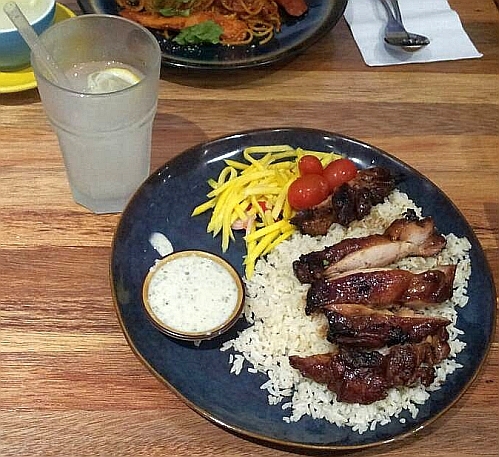 Will drop by to try it someday. Were the brownies any good? oh that is why my friend told me that pattisez and 300 have the same owner when they were buying coffee at pattisez stall in 1u. the brownies were cut into too small cubes so they were kind of dry. You finish the brownies? Wow. You have sweet tooth. I am not so into brownies, mostly too sweet to my liking. oh the brownies here are not as sweet as the normal brownies. I guess you like all the taste on their own. I will choose the green pesto coz I like green! lol.. I like pesto too but don't want to eat pasta so I didn't order that. The brownies look dry. I am not a brownie fan but will eat as not to waste them. That was what I did. They were quite dry, you are right. 300!! I must take a look. I wonder why bosses like to change the restaurant names nowadays like Miaw Miaw's case too. Wah your stomach depends on your mood.